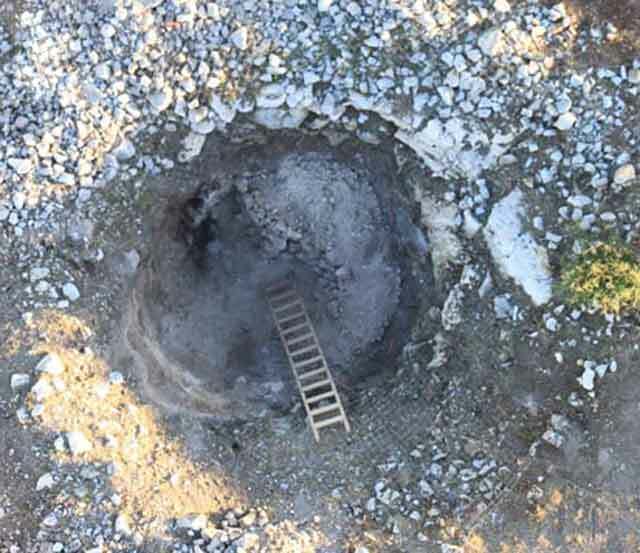 In April–June and November–December 2014, a salvage excavation was conducted at the Horbat Hammim (Permit Nos. A-7082, A-7257; map ref. 197316–9251/644408–5413), prior to the construction of the Nofim neighborhood in Modi'in. 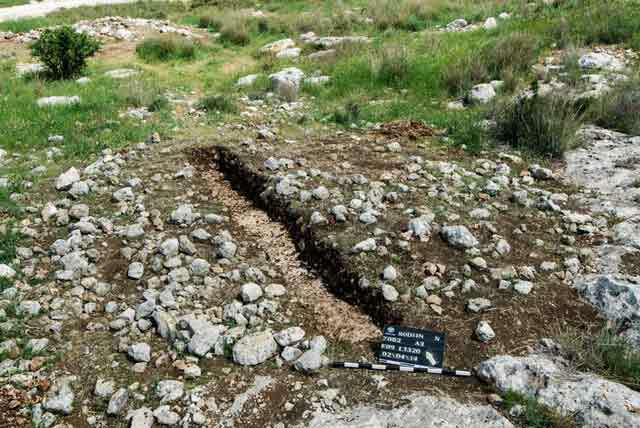 The excavation, undertaken on behalf of the Israel Authority Antiquities and financed by the Israel Lands Administration, was directed by E. Haddad, with the assistance of Y. Amrani and E. Bachar (administration), Y. Elisha, A. Danzinger, D. Shahar, Z. Rosenblit and L. Golan (area supervision), P. Spivak (area supervision, prehistoric survey and excavation at Point 412), M. Kahan, R. Mishayev and R. Liran (surveying and drafting), A. Peretz (field photography), C. Ben-Ari and A. Dagot (GPS), D. Levi and M. Birkenfeld (GIS), L. Drezner (metal detection), M. Haiman (development survey and preliminary inspections), I. Kornfeld (antiquities inspection), U. ʽAd and L. Rosenblum (computing), R. Bar-Nathan, A. De Groot, Y. Rapuano, D. Sandhaus-Re’em and P. Gendelman (pottery consultation), A. Gorzalczany (scientific guidance), R. Yosef (replanting of geophytes) and the Sky View Company, Ltd. and Griffin Company (aerial photography). Additional assistance was rendered by A. ʽAzab, A. Shadman and G. Itach. 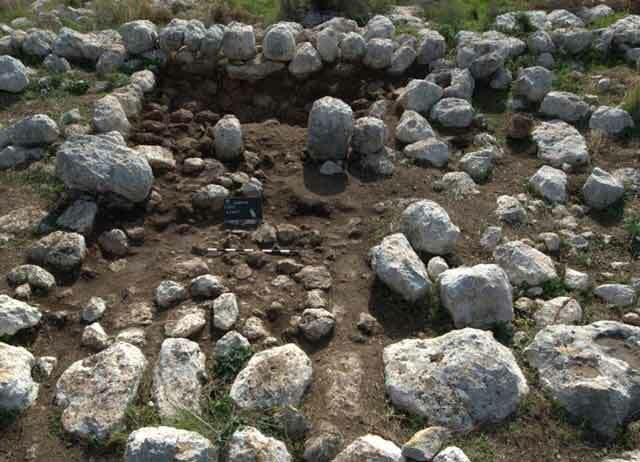 Pupils from schools in the Modiʽin region participated in the excavation, within the framework of the Archaeological Education Center of the IAA Central Region. The excavation was conducted in an open area (c. 500 × 1,500 m; Fig. 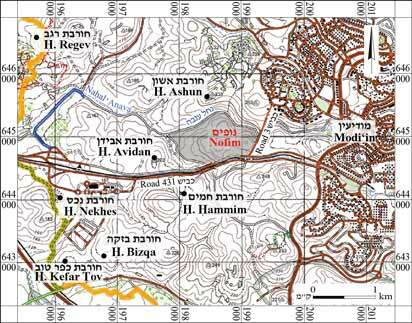 1: Nofim) bounded by Nahal ʽAnava on the north, Highway 431 on the south, a wadi that descends to Nahal ʽAnava on the west and Highway 3 on the east. In this area, two elongated hilltops (c. 200 m asl) run in a north–south direction, separated by alluvium soil that slopes very slightly northward, toward Nahal ʽAnava. The spurs descend moderately southward, where the terrain is rocky and the bedrock is mostly exposed. Three ancient ruins are located nearby: Horbat Ashun in the north, on a hill beyond the northern bank of Nahal ʽAnava; Horbat Avidan in the southwest; and Horbat Hammim in the south, beyond Highway 431. Two excavations were conducted in the past at Horbat Ashun: a small scale excavation at the western end of the ruin, where a burial cave, agricultural terraces, field walls and pottery from the Byzantine period were revealed (Kanias 2005), and a large excavation at the center of the ruin (Permit No. A-7484). 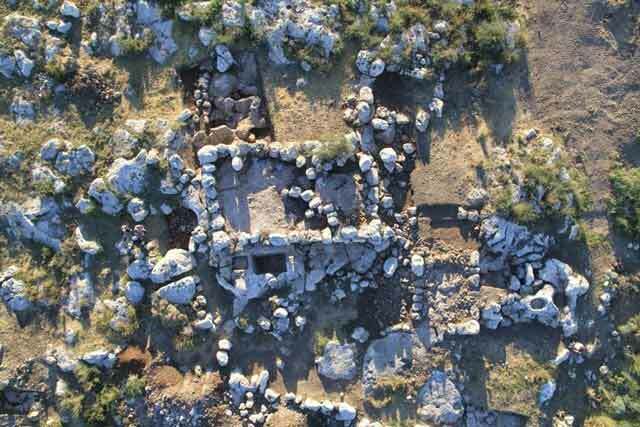 A square building dating from the Persian period was identified in a survey at Horbat Avidan (License No. S-432/2013; M. Haiman, pers. comm.). 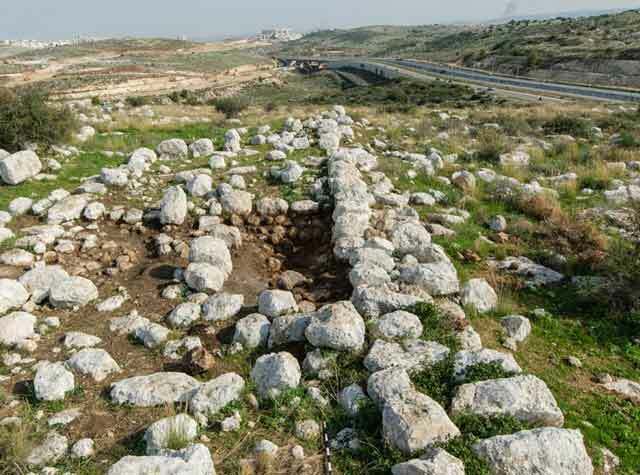 Several excavations were previously conducted within the boundaries of the declared antiquities site of Horbat Hammim (Ein Gedy 2005; Kogan-Zehavi 2009; Dagot 2010; Segal 2010), but the ruin itself has never been excavated. 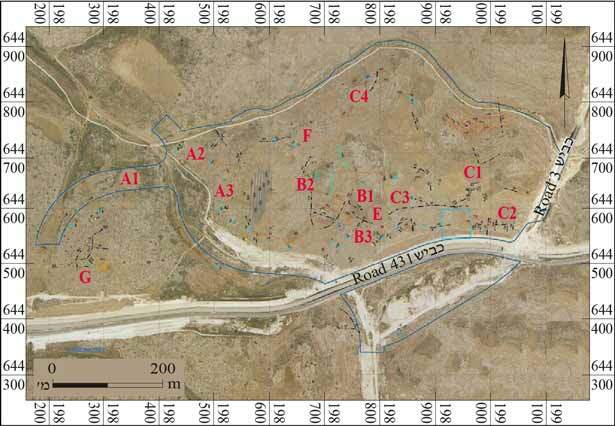 Excavations were conducted in thirteen areas (A1–A3, B1–B3, C1–C4, E–G; Fig. 2), where 130 ancient remains were found scattered across the surface. These included a farmhouse, a fortress, stone clearance heaps, field towers, terrace walls, roads, field walls, winepresses and limekilns. Several terraces were documented on a hill (235.92 m asl); one may date from the Hellenistic period (third century BCE). In a rocky area in the center of the hill were the remains of two superimposed winepresses, the early one undated and the second from the Byzantine period, representing early and intermediate phases of activity on the hill. A Byzantine-period structure, representing a later phase, canceled the winepresses. 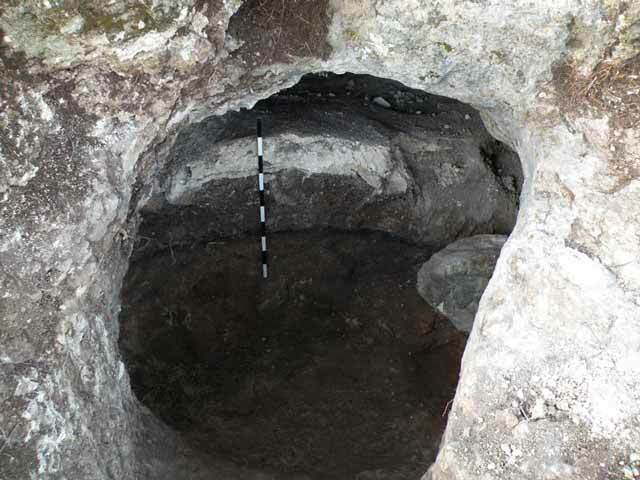 In addition, cupmarks, a cistern, a cave and a limekiln were discovered. 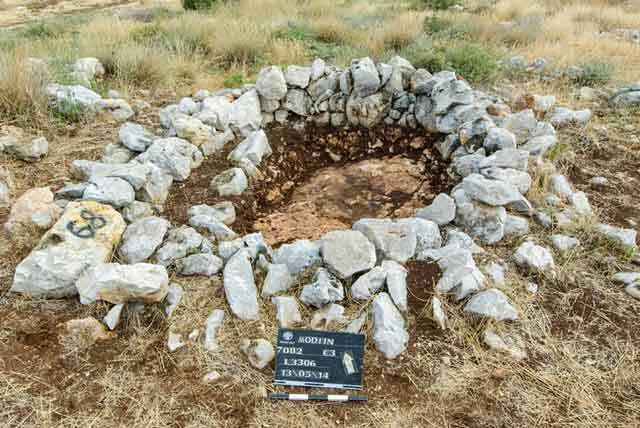 All these elements seem to have been part of a farmstead that was bounded on the south by a massive wall adjoined by a glacis built of small fieldstones; their date could not be determined. Winepress and Building Remains. A treading floor (c. 1.5 × 2.0 m) and an open channel were hewn in the early phase; the latter led to a collecting vat in the west, but it was not preserved. Gray-white plaster was preserved on the bedrock east of the channel; it was apparently used to fill a natural depression in the rock so as to level the treading floor. The winepress constructed in the intermediate phase comprised a square treading floor (3.5 × 3.5 m; Fig. 3), a settling pit and a collecting vat paved with an industrial mosaic, several sections of which had survived. The mosaic’s foundation canceled the channel from the early phase. It appears that the early collecting vat was enlarged and made deeper during this phase. The must flowed from the treading floor to the settling pit by way of a narrow conduit (probably natural) in which plaster remains were found. From the settling pit, the must flowed to the collecting vat via a circular perforation in its southern wall. In the later phase a building (c. 7 × 9 m; Fig. 4) was constructed whose walls were partly founded on bedrock and partly on the sides of the treading floor, thereby negating the latter. The walls were built of medium-sized fieldstones (average dimensions 0.6 × 0.7 m). A wall that partitioned the building into two spaces, north and south, was partially exposed. Southwest of the building was a room whose walls were constructed of fieldstones and founded on bedrock. Cistern. The opening of a plastered cistern (depth c. 5 m) was uncovered c. 15 m southeast of the building; the cistern was not excavated. A capstone stood upright over the cistern’s opening (Fig. 5). A round, rock-cut settling pit that served to filter the run-off which flowed down the hillside was noted near the cistern’s opening. A rock-cut basin was located slightly west of the cistern. At the bottom of the basin’s northern wall was a hole that may have been used to tether an animal to a manger; if the hole was plugged, the basin could serve as a water trough. Cave (Fig. 6). East of the building was a cave with two openings, one located in the northeast and another, blocked with fieldstones, in the west. A large quantity of animal bones, several pottery sherds, including a fragment of a lamp from the Early Islamic period, and flint tools were found in the cave. Except for the animal bones, it seems that the finds were swept into the cave. Limekiln (diam. c. 2.5 m; Fig. 7). A probe excavated inside the kiln revealed that the installation was filled with burnt limestone. Its walls were lined with square building stones, of which only several courses were preserved. 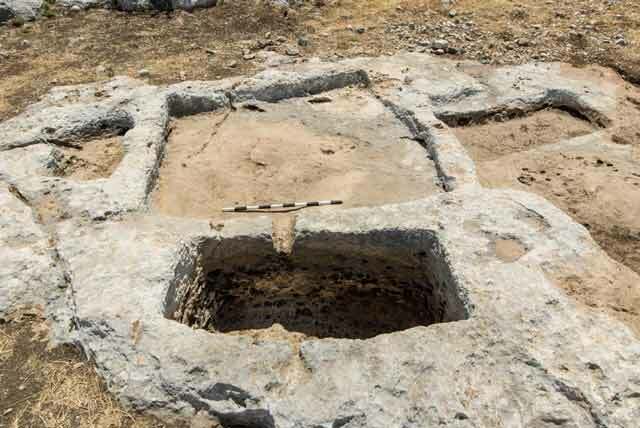 Owing to technical constraints, the kiln was not excavated down to its floor. 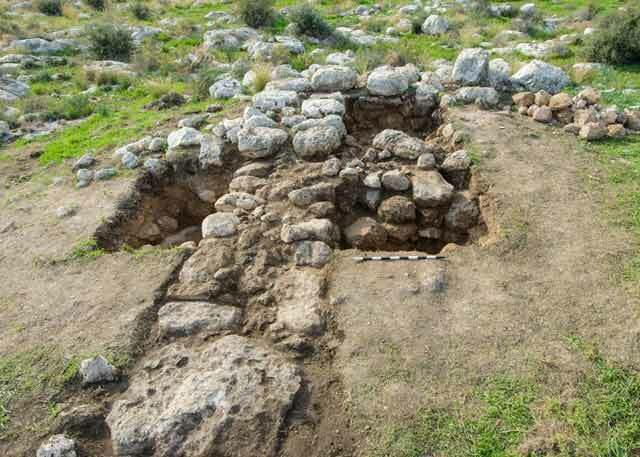 Area A1, along the entrance road to the planned neighborhood, yielded a winepress (Fig. 8), a cupmark and five retaining walls. 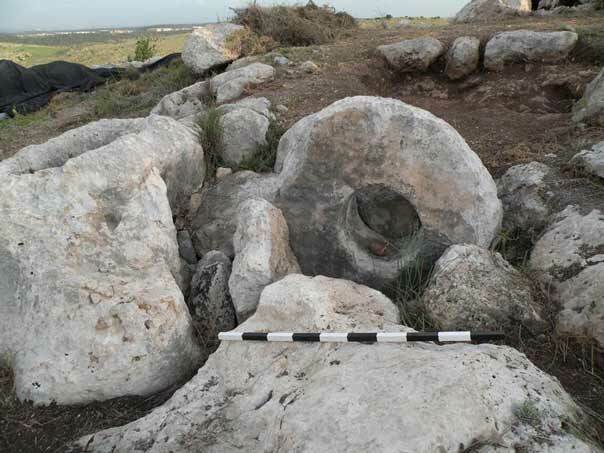 Area A2 yielded a winepress, a tomb(? ), five stone clearance heaps (e.g., Fig. 9), six agricultural terraces and a cupmark. 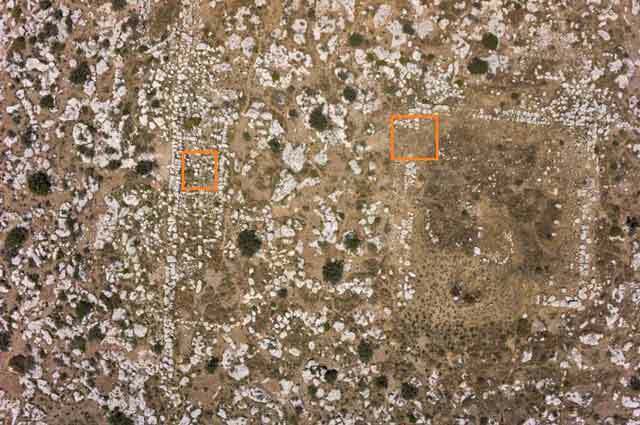 Area 3 yielded three rock-hewn winepresses, three field towers (e.g., Fig. 10), eight stone clearance heaps (e.g., Fig. 11), six retaining walls, an animal pen and cupmarks. Area B2 (Fig. 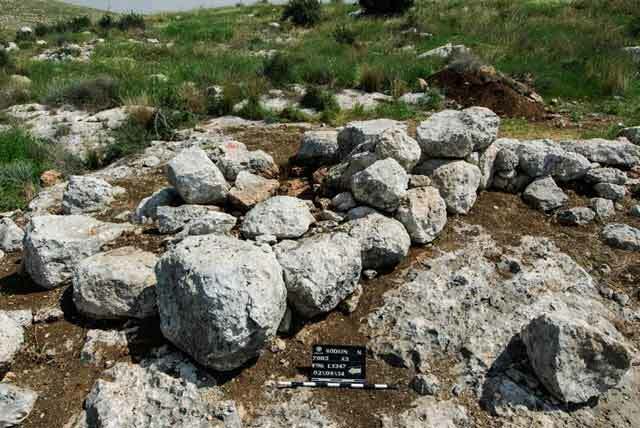 12), located on a hill, yielded 16 ancient remains. A large, poorly preserved rock-hewn limekiln was exposed on the western slope (Fig. 13). The installation was lined with medium-sized fieldstones, only small sections of which had survived. A large opening of a natural cave (c. 6 × 7 m; Fig. 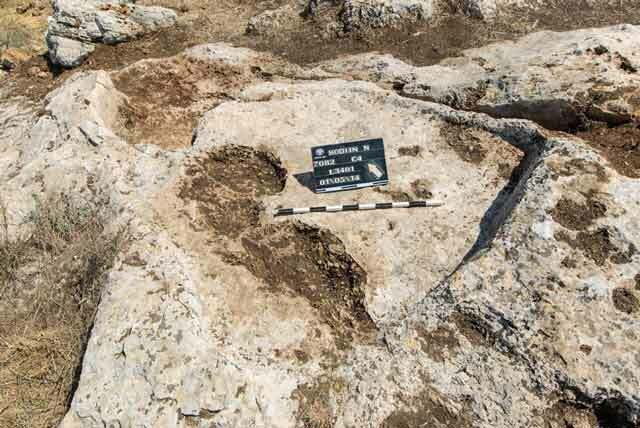 14) was exposed on the northern slope of the hill; it was apparently blocked in the past by a stone. The cave’s ceiling had collapsed inward, covering a thick burnt layer was. No pottery sherds were found in a probe excavated within the cave, suggesting that it was probably an animal lair. Narrow openings leading to burrows in three of the walls were likely dug by animals. 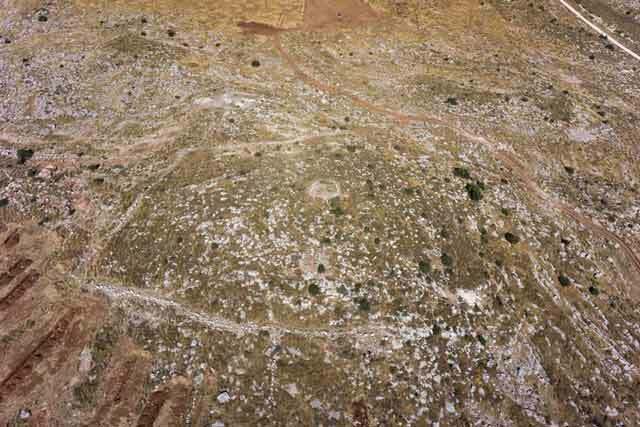 In addition, 11 field walls, a circular field tower and two circular stone clearance heaps were documented. Area B3 was characterized by rugged bedrock outcrops over a south-facing slope. Three stone clearance heaps, two field towers, two agricultural terrace retaining walls, two field walls, a rectangular field tower and an animal pen were excavated. Area C1. Two winepresses (e.g., Fig. 15), a section of an ancient road (Fig. 16), a rock-cut shaft, three cupmarks, two stone clearance heaps and eight agricultural terraces were excavated. Area C2, opened in an orchard with various fruit trees, such as almond and fig, comprises a set of field walls—seven aligned in a north–south direction and four aligned in an east–west direction (Fig. 17)—that formed rooms. The bedrock was stepped toward the south, and the lateral walls were constructed along the high part of the slope. Topsoil devoid of any datable ancient remains was found in a probe excavated near one of the lateral walls. Judging by the building style, the walls appear recent, probably built sometime during the past one hundred years. Area C3 yielded three stone clearance heaps and a building, possibly a field tower (Fig. 18). Area C4 yielded a field wall, three stone clearance heaps and a winepress (Fig. 19). 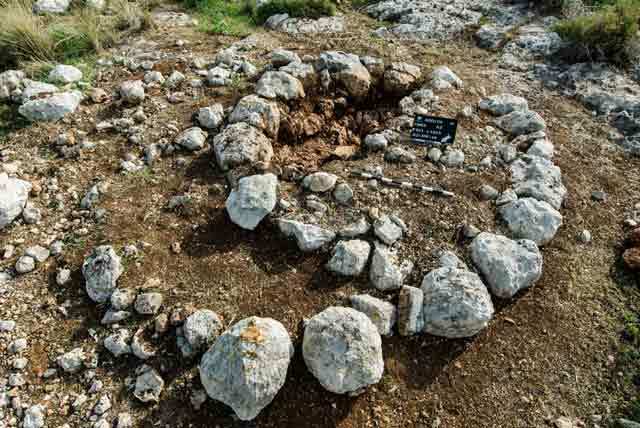 Area F yielded an ancient road, a circular field tower (Fig. 20), a building(?) and four stone clearance heaps. The excavation area was located within the declared antiquities site of Horbat Avidan, on a saddle leading up to rocky hills that stretch both on its west and east. Two small wadis descend from the saddle: south of Highway 431 and north of Nahal ʽAnava. The wadi to the south is wide and rich in alluvium, whereas the wadi to the north is narrow and has a thinner layer of alluvium. Horbat Avidan is a square building on a hilltop (201.66 asl) that is mostly stony. In a development survey carried out by M. Haiman (License No. S-432/2013) the following antiquities were documented: agricultural terrace retaining walls, animal pens, a stone clearance heap, a cupmark, a field tower and an ancient road. The survey points were excavated and documented in the current excavation. The square structure on the hilltop, identified by the surveyor as a Persian-period fortress, is located beyond the boundaries of the area slated for development; however, its importance in understanding the archaeological remains spread out across the area is significant. Therefore, a square was excavated inside the fortress, and another was opened in the casemate rooms to its south. The Structure (30.5 × 30.5 m; Fig. 21) is built of thick walls (width c. 1.35 m) constructed of two rows of large, roughly hewn stones, with a fill of small fieldstones and earth in between. A limekiln built on the eastern wall negated part of it. 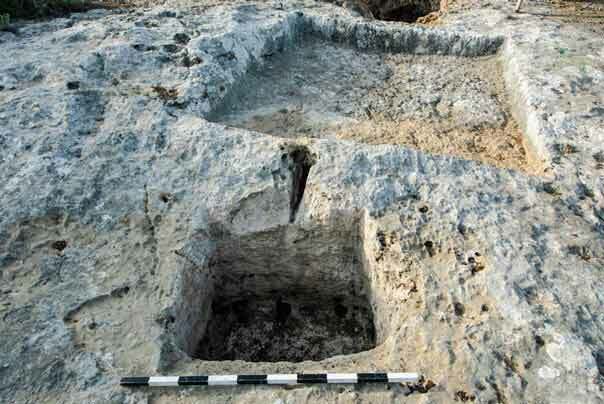 A square was excavated in the northwestern corner of the building, unearthing both interior and exterior parts of the structure (Fig. 22). A large, dense collapse of roughly hewn, medium-sized fieldstones was uncovered inside of the building, next to the walls. Beneath the collapse was a floor made of limestone and crushed chalk, possibly the habitation level in the building. Numerous body fragments of light-colored jars, a cooking pot handle from the end of the Iron Age (late seventh century – early sixth century BCE) and a pinched lamp, typical of the Persian period (fifth–fourth centuries BCE), were found below the floor. A massive north–south wall built of large, roughly hewn fieldstones was revealed in the eastern part of the structure. A trial trench excavated down to bedrock outside of the building, adjacent to its southern wall, yielded only several non-diagnostic pottery sherds. The Casemate Rooms (Figs. 21, 23). A row of casemate rooms running in an east–west direction was identified 50 m south of the square structure. An excavation square was opened, and it was ascertained that the space between the two outer walls was divided into two rooms: northern and southern. A pair of large fieldstone doorjambs belonged to the doorway between the rooms (Fig. 24). Part of the southern room was excavated down to bedrock; it was determined that a foundation of small and medium fieldstones had been set on the bedrock, probably to level the surface. A small section of a floor(?) 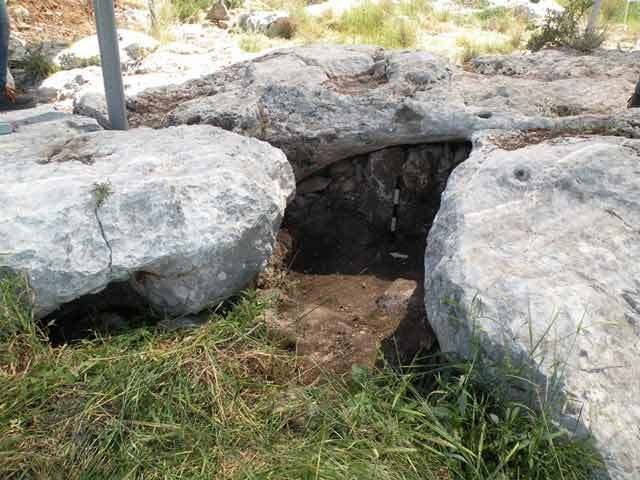 made of small fieldstones and soil was exposed at the base of the doorjambs. The wall delimiting the two room on the east was set on a wide foundation built of two rows of stones, which possibly served as a bench. Several pottery sherds were found in the excavation, including jar rims, probably from the Late Persian – Early Hellenistic periods (end of the fourth century BCE). The casemate’s western wall has not yet been revealed, and is possibly located beyond the limits of the excavation square. The excavation in the northern room could not be completed due to technical constraints. The bedrock surface north of the rooms was largely exposed, indicating that the habitation level in antiquity was at a similar elevation as that of the current surface. At least seven rooms arranged in a line and with internal partitions were identified in an aerial photograph (Fig. 21). No openings were discerned in the closing walls to the north and south; nor were any discerned in the excavation area. These will probably be revealed in a future excavation. 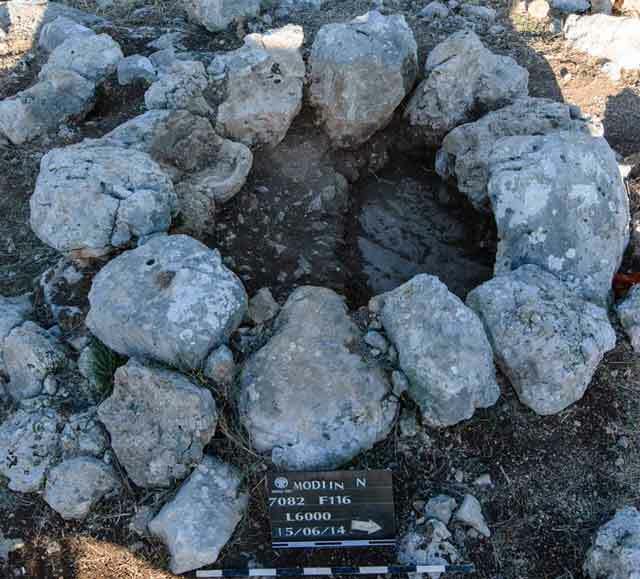 A sample survey and documentation of a prehistoric site on a prominent hilltop (Area B1) revealed, based on a fossil directeur, that it existed during the Pre-Pottery Neolithic A period. Modiʽin, which is situated at the foot of the ridge of the Judean Hills, is characterized by calcareous rock rich in flint of the Mashash Formation. Veins of natural flint nodules can be seen on the bedrock surface along most of the rocky hills of this area. In recent years, several archaeological sites from the beginning of the Neolithic period were documented within the boundaries of the city; all of them are located on hills that stand out prominently amid their surroundings. No architectural remains have survived at the sites, and the flint implements are the only evidence of human activity. The most prevalent tool at these sites is the axe. Since it first appeared at the beginning of the Neolithic period, the axe was constantly being developed, and therefore can serve as a fossil directeur on which a relative chronology can be based. Typological features of axes from the Modiʽin sites, including the Nofim neighborhood, make it possible to date the human activity associated with them to the early Pre-Pottery Neolithic period. Most of the axes found at these sites broke, either during the knapping process or while being used. Some 1,080 flint items were gathered from the surface on the hilltop and on the southern and western slopes (50 × 50 m; the items were collected systematically in accordance with a grid). Another 380 items were collected in a trial trench (Area E) and during sifting of the soil removed from the trench. The repertoire of debitage indicates that axes were both prepared and used there. To this end, local flint was utilized; it was found on the surface and as chunks of various sizes in the bedrock. Of the seventy tools that were found, about half are axes. Other flint implements, also common during this period, such as notches, denticulated flakes, blades and scrapers, were discovered alongside the axes. However, it is important to emphasize that as in other sites in the Modiʽin area, no tools indicative of either hunting, namely arrowheads, or agriculture, namely sickle blades, were found at the site. 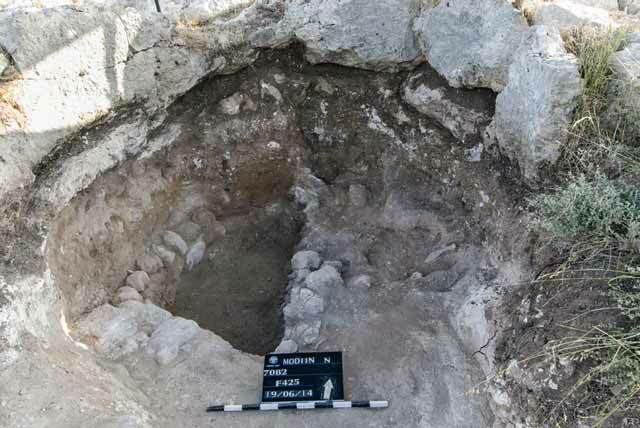 The excavation revealed that extensive activity transpired in the open area during the Pre-Pottery Neolithic A. The fortress, the first to be unearthed in Modiʽin, probably dates to the fourth century BCE—the transition between the Persian and Hellenistic periods. It is strategically situated, with a commanding view in all directions, a direct line of sight with Tel Gezer, which stands out prominently to its southwest, and a view of the sites on adjacent hills, such as Horbat Nekhes, Horbat Regev and Horbat ʽAnava; in addition, an ancient road passed near the fortress, as documented in the survey. The massive walls of the fortress structure clearly indicate it was intended for defensive purposes. The survey performed to its north, west and east of revealed that it is situated in the center of an enclosure surrounded by the remains of walls, which might have delineated the place in the past. The Lod region, in the northern Shephelah, appears in the list of returnees from Babylon (Nehemia 7:37), suggesting that the fortress was built along the border of the province of Yehud with the coastal plain; alternatively, a Persian army unit may have been stationed there to watch over the routes leading from the hill country to the Lod Shephelah. 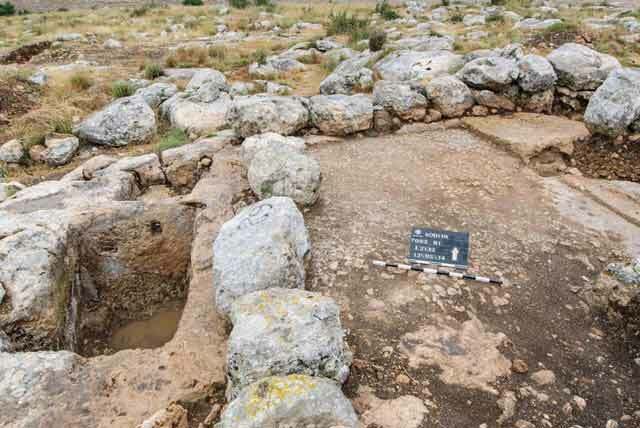 Future archaeological excavations in the fortress compound and its environs will contribute significantly toward understanding its role in the region. Numerous Byzantine remains were scattered throughout the open spaces, except for near the fortress. The agricultural area was dated to the Byzantine period based mainly on the finds from the farmhouse that was excavated in the center of the excavation area. An analysis of the archaeological data suggests that during the Byzantine period the area was used for agriculture, particularly for growing vineyards. Numerous agricultural terraces in the area date from the Byzantine period; judging by the pottery sherds from probes opened alongside them, some may have been used in earlier periods (i.e., the Hellenistic and Early Roman periods). The construction of the farmhouse obsoleted a treading floor of a winepress, which went out of use during the Byzantine period. Although the treading floor was poorly preserved, indications of a mosaic could still be discerned. In the excavated area were additional rock-cut winepresses, each of which was equipped with a settling pit that faced the natural slope of the bedrock; the unearthed winepresses were generally of a similar plan. The winepresses were most likely used in the immediate vicinity of the agricultural plots. The excavated area is delimited by natural boundaries — Nahal ʽAnava to the north and a small wadi to the west. Apart from the farmhouse complex, no other residential buildings were uncovered, giving rise to the question of who cultivated the area in the Byzantine period. These were possibly the inhabitants of Horbat Ashun or of Horbat Hammim. The results of the excavation show that there is no evidence to indicate that oil was processed in the area under discussion. It is interesting to note that only one cistern was found in the entire area, on the grounds of the Byzantine farmstead. The cistern was documented on the Survey of Western Palestine map (Conder and Kitchener 1883: Sheet XVII; Fig. 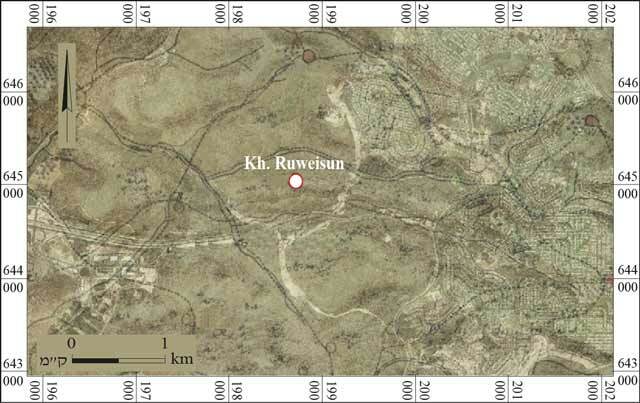 25); where the excavated ruin (Area B1) appears as Khirbat Ruweisun and Horbat Avidan is recorded as Umm es-Semmeikât. 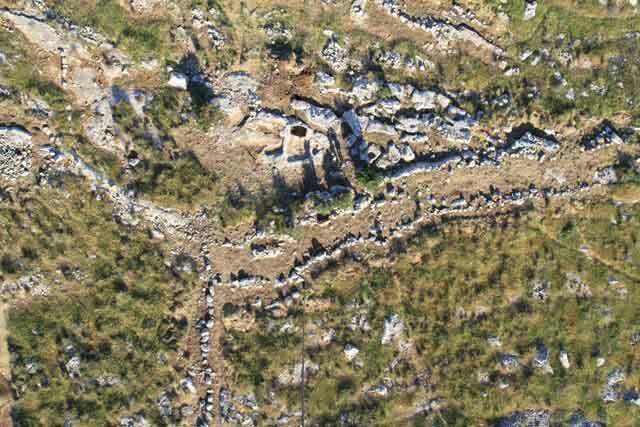 Unlike Area B1, where there was a farmhouse in the Byzantine period, no evidence of a Byzantine-period presence was discerned on the hilltop or within the fortress in Area G .
It seems that quarry drilling was conducted at the site during the time of the British Mandate, as indicated by piles of quarried limestone that was used as raw material for the limekilns situated along Nahal ʽAnava. Dagot A. 2010. Nahal ʽAnava. HA-ESI 122. Ein Gedy M. 2005. Modiʽin. HA-ESI 117. Kanias T. 2005. Horbat Ashun (West). HA-ESI 117. Kogan-Zehavi E. 2009. Khirbat Umm el-‘Umdan and Horbat Hammim. HA-ESI 121. Segal O. 2010. Horbat Hammim (South). HA-ESI 122. 4. 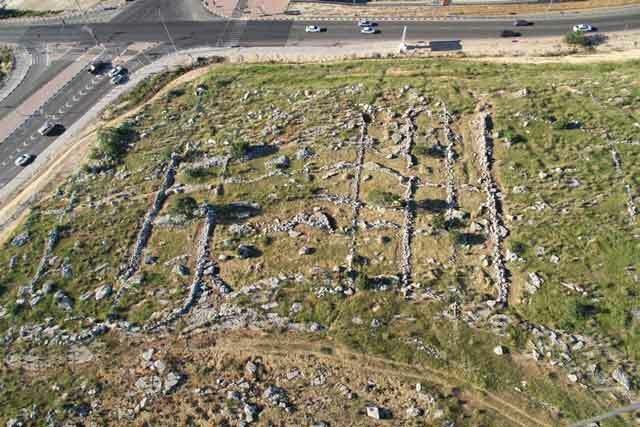 Aerial photograph of the Byzantine structure, looking east. 5. The capstone leaning on the opening of the cistern, looking north. 6. The cave opening, looking east. 9. Stone clearance heap, looking southeast. 10. Field tower, looking east. 11. Stone clearance heap, looking north. 12. Aerial photograph of Area B2, looking west. 13. Aerial photograph of a limekiln, looking north. 14. Entrance to a cave, looking south. 16. Aerial photograph of an ancient road, looking west. 17. Aerial photograph of the ‘orchard’, looking south. 18. Field tower, looking north. 20. Field tower, looking west. 21. Aerial photograph of the fortress, looking west. 22. The southeastern corner of the fortress, looking west. 23. The casemate rooms, looking east. 24. The excavation squares inside the casemate rooms, looking south. 25. The British survey map superimposed on a modern aerial photograph.